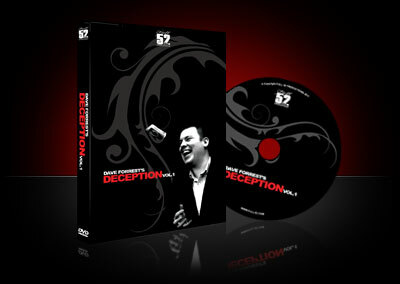 Dave Forrest (creator of Colour Burn and Nothing In Transit) is back with Deception, a new collection of close-up magic bearing all the hallmarks that have made Dave one of magic's most respected creators. This, the first volume of Deception, is quite literally bursting with clever concepts, astonishing routines, devious moves and diabolical gaffs! We don't stock every new DVD that's released at Vanishing Inc. but we do stock the best; this is one of them! Here's a complete list of what's in store: ONE MORE THING: The four Kings are lost in the deck and then sudenly produced from four very unexpected places. ONE: A named card is the only one in the box. Dave opened his Magic Castle act with this effect - a STUNNER! MATRIX: Four X's drawn on the back of a signed card magically congregate in one corner, visualy moving one at a time. PICCALILLI: An incredibly magical sandwich effect with two selected cards! S.C.T.A: A clever and direct handling of 'Spectator Cuts the Aces'. MENTHOLISM: A signed card visualy appears, folded up inside a completely empty Tic-Tac box! You have to see it to believe it - it's JAW DROPPING! DALI: A prediction - a drawing of a playing card - suddenly jumps off your business card becoming a real miniature card! THE SPECTRE: An ingenious gimmick that allows you to produce any card from the card card case. DISCARDED: A selected card appears between two Aces on the table that shouldn't even be there! Dave's handling of a popular John Bannon effect. PROBLEM SOLVED: This could well be the most direct handling of the Hofzinser Ace Problem ever devised. R.S.M.S: The Riffle Shufle Multiple Shift allows you to invisibly control a number of cards to the bottom of the deck under cover of a riffle shuffle. DON'T BLINK: Two variations of an incredibly open and visual colour change. With just a wave of the pack and without cover, one card morphs into another! PLUS: You'll also learn the incredible WHIRLIGIG CONTROL, the ROUNADBOUT PRODUCTION and Dave's TILT SUBTLETY!